Your skin is the largest organ of your body. It is alive and it breathes, grows and constantly changes. It is the first barrier and has the great task of protecting you from bacteria, viruses and pollutants. It also regulates body temperature and helps to remove toxins from your body. It reflects what you eat and drink, how much sleep you had, how relaxed or how stressed you are. Everyone is longing for healthy and silky skin. No matter how old we are, we women try many things to achieve a beautiful skin complexion. One of the tricks is to exfoliate and moisturise. Scrubs can exfoliate lifeless skin cells in a soothing way. To achieve this, a weekly skincare routine is needed. You would not think how much you can do for your skin in a few minutes for making it radiant and healthy looking. There are a lot of benefits of using a scrub on regular basis. It removes dead skin cells, combats blemishes and it can be a great help to reduce discolourations. With a natural exfoliator you can polish away uneven dry patches for an even-toned complexion. If you avoid harsh chemical peels and opt for products that use natural ingredients in the right proportion you do extra good to your skin. Exfoliators can be the perfect treatments for your skin especially if they are prepared with natural ingredients. Sugars, finely ground salt, poppy seed, ground nuts and pulverised apricot kernel or clay all have their use and benefits. Finely ground nuts and powdered clay are rather used for exfoliating facial skin, sugars and salts are main ingredients for body scrubs. Sugar-scrubs are more suitable for delicate skin while a fine salt scrub can turn out to be a superb skin-polishing treatment as well. Velvet Touch Body Scrub is a good choice for a relaxing evening with hot bath and candles. There are many different types of sugar used in natural body scrubs. Coarse, castor and fine brown sugar are all good for sweet and pampering skincare products. There are several types of natural salts widely used in skin and body care, too. Dead Sea salt has a very high mineral content while red-, pink and white freckled Himalayan salt is the purest salt on earth. But the well known sea salt and epsom salt can be also part of exfoliation. Coarse sugar or salt is great for foot and hand scrubs while finely grated ones are usually part of a body scrubs. Butters are also often added to the formulation. Mango or shea butter are excellent moisturisers, while unrefined organic cocoa butter can lift a scrub to another level with its smooth dark chocolate aroma. With a hint of peppermint our Choko Kiss Body Scrub will not only nurture your skin but can boost your morning mood. Scrubs containing nourishing carrier oils provide you with a winning formula for a visibly improved skin texture. Carrier oils are loaded with nutritious vitamins and beneficial fatty acids. Cold pressed and organic carrier oils have a higher content of skin-nurturing compounds like tocopherols (vitamin E) and are free of artificial chemicals. If you aim to have the most gentle and natural exfoliator it is worth to chose one which contains organic and unrefined ingredients. Each oils have moisturising properties and while some are especially for sensitive skin like evening primrose or avocado, others are better for mature skin like rosehip, or for dry skin such as argan, jojoba or coconut oil. Flower Power Body Scrub contains not only coconut oil but it is scented with rose geranium essential oil to balance your skin and mind. 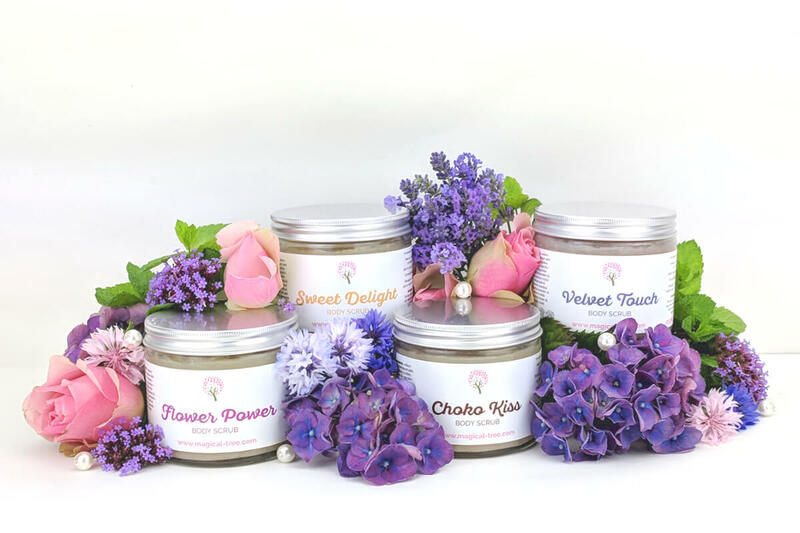 Body scrubs blended with beautiful essential oils will open up a whole new world of aromatherapy for your wellbeing. If you would like to have an uplifting morning then worth to use a scrub with a refreshing aroma like mint or lemon while having your morning shower. If your are enjoying a smooth evening chose a scrub scented with lavender, ylang ylang or chamomile. But if you are looking for a relaxing treat just bring a bit of a luxury to your bathroom. Sweet Delight Body Scrub is blended with the sweet scent of coconut and fruity orange to make you feel being in a Spa. Although exfoliators have great skin-smoothing properties it is worthwhile to mention: better less than more. Don’t use a scrub on daily basis, only periodically: normal and mature skin can be gently exfoliated twice a week, sensitive skin rather just once to lift old skin cells and stimulate new cells. Never use it on broken or damaged skin. 1. Moisten clean skin with a bit of warm water before using a scrub. 2. Apply a small amount of exfoliator onto the skin, and gently massage your skin in circular motions. 4. Gently dry the skin with a soft towel. Take extra care with natural scrubs which do not contain any preservatives. The introduction of any water into the container can cause mould. To prevent this, always use a clean, dry spoon or cosmetic spatula. Don’t forget to store your scrub in a cool and dry place with lid closed tight. Be cautious using a natural body scrub combined with oils in the shower or bath tub because it may make its surface slippery. There is just one more thing left to do: try a natural body scrub and enjoy the experience of wellbeing and smooth skin!